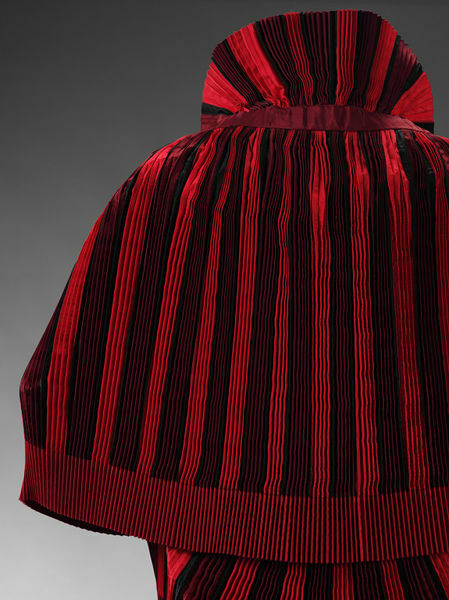 This crisply pleated cape is made up from red and black rayon grosgrain ribbons. The richly coloured ribbons were sewn together, and then the fabric was accordion-pleated. The double-layered cape and ruffled collar are one continous piece of fabric. The lightweight silk fabric clings to the wearer on the underlayer, whilst the top layer hangs in stiff, rigidly sculptural folds. Matilda Etches is now almost entirely forgotten except as a theatre, ballet and opera costume-maker. However, she was an extremely talented couturier, whose fashionable clothes were innovative and very carefully made. The design for the 'Butterfly' cape was patented in 1953 - this is a 1949 prototype. When she donated a selection of her work to the Museum in 1969, this cape and a dress, 'West African' (see T.186-1969) were shown to senior Museum officials as key acquisitions. They were the first modern fashion items to be accorded this honour. 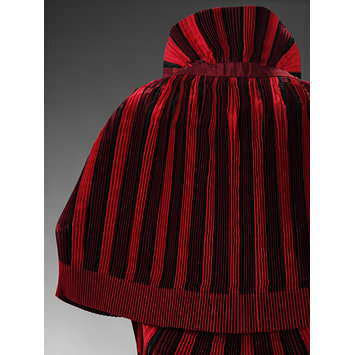 Evening cape made of rayon grosgrain ribbons in red, maroon and black, stitched together and then knife-pleated to create a one-piece and double-layered cape with a collar. Elasticated band of fabric connects the front facings of the collar and the arms are threaded through it,and an elastic band goes across back. Splits in fabric on underlayer for arms. With the patent document and four pieces of toile. The original version of this cape was created in 1949 for the ballerina Dame Ninette de Valois, who founded the Royal Ballet. "The image of our 20th century costume collection has received a great boost through you! For the first time clothes from this century have been chosen to show the meeting of our advisory committee - a honour usually reserved only for medieval embroideries. They are to see the Butterfly cape and the West African cotton dress." Historical significance: This was the first 20th century V&A fashion donation to be shown to the advisory committee, along with Etches' dress, "West African"